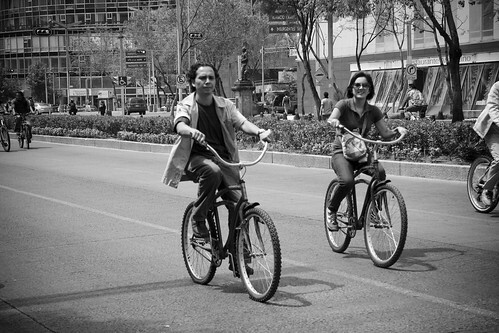 Another installment from the Sunday ride on the Reforma boulevard in México City. This one featuring various couples. Love the bikes with the big handlebars - not great for dodging traffic in London though! Interesting bikes! I'd like to see more sucha bikes on Polish streets. When I lived in Cracow, I sometimes saw something like that, but now, in my small time, it would create a sensation! Greeitings from Gorlice in southern Poland! Interesting bikes! I would like to see more such a bikes on Polish streets. When I lived in Cracow, sometimes I saw something like that. But in my small town it would create a sensation! Greetings from Gorlice in southern Poland! 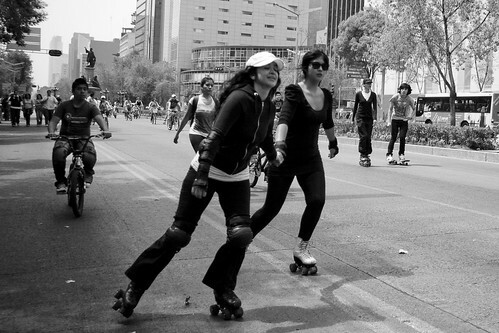 I like bike but yes, skates also make more fun to travellers. I particularly like the last picture. 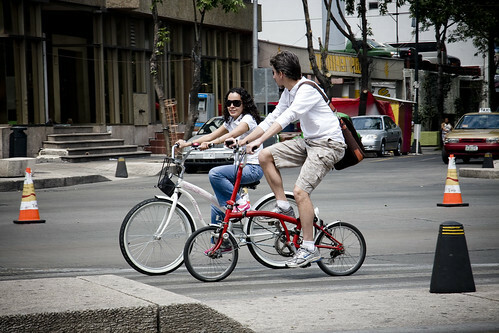 That's a red Brompton in the first picture! And is he riding with his friend on a white rental bike? 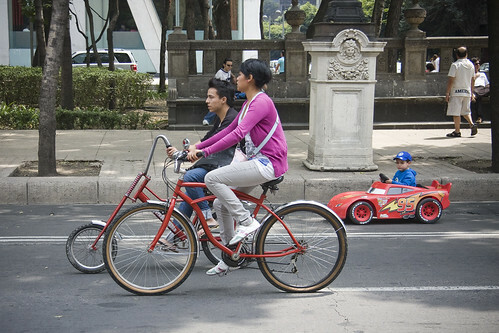 Clever, that way he can fold the bike and share a taxi when she returns her rental bike! Would love to know what the boy in the car grows up to do! Will he be the next cycle chic advocate? Love the inclusion of roller skaters. Funny thing though, once I stopped skating and started blading, I could no longer stand up on roller skates!